Irish crystal champagne flutes are cut in the Raindrops pattern. These Irish champagne flutes are now sold out. 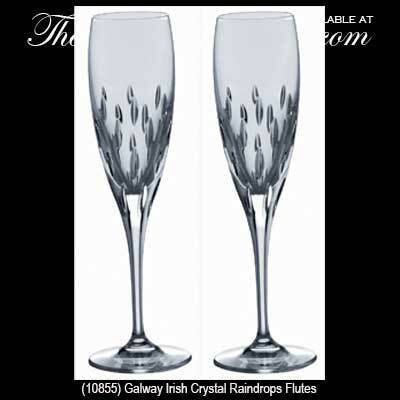 The Raindrops wedding flutes are made of 24% leaded Irish crystal and feature a cut design. The Galway Crystal champagne glasses are perfect as toasting flutes for any celebration including weddings. A pair of Raindrops glasses measure 10" tall and are limited to stock on hand. The Irish champagne flutes are gift boxed, complements of The Irish Gift House.